« Freeze! I’m a frost mage – Here, have a iceblock. It happens every year since I’ve played – Now I ride past all the happy people with their bright red hearts, and mine is black. It’s all a show I promise you – the Bad girl Night Elf in Shadow Form. I could pretend I’m something I am not and wear my healing cloth, but I only truly enjoy that when I am helping other people kill horde in Pvp. That heart would be blood red, dripping with the blood of the fallen. Who’s interested in someone with a black heart?, all the male Shadow priests are busy looking for redemption in the arms of holy priests. It used to be capable of feeling, I promise, I didn’t forsake love when I donned the Shadow form. I still have feelings. 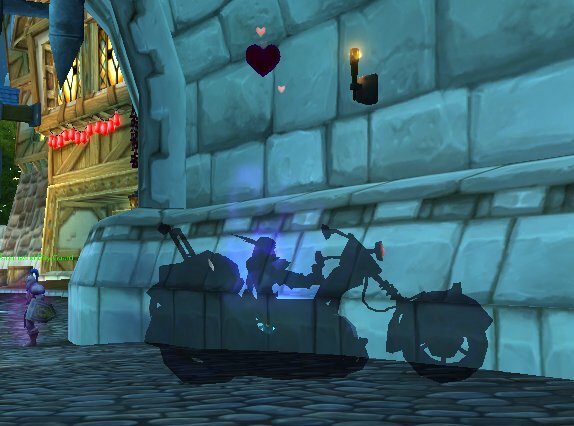 Even Warlocks get red hearts. Or arrows over our heads when we are about to eat a meteor or ice tomb. Doubt the sun doth move. But never doubt I love” ~ Shakespeare.